My fingers, clutch a piece of dosa, with its aaloo filling just dipped into warm sambhar and cool coconut chutney and do manage to make it into my mouth, and mmmmm, mmmmm. MMMMMMMM. The taste of home. “It’s this stupid; this is the main reason that I, and I suspect many thousands of others have found ourselves here in ‘Little India’ “ I tell myself. It’s a wonder I got from the dosa stall to a table, five steps away without the dosa, chutney and sambhar flying off the plate I hold. As I savour the food in my mouth, taking ever so long to feel every flavour I possibly can before it’s all gone, I hear a young man on the opposite side of the small circular table we are standing around say, “I like it here because this feels like the ‘Mumbai locals’ ”. He catches my eye as I smile and he smiles back. I keep my elbow close to my body so not to knock down the morsel making it’s way from hand to mouth of his companion, next to me. Yes, we are home. Back home where, to place your foot down requires some planning, some foresight and sometimes more serious strategies as does the placement of your elbow. The elbow is a very useful tool when you need to get off a ‘Mumbai local’- otherwise just called a train. Did this young man, smiling happily at me, a stranger, ever in his young life think he would miss a Mumbai local train? I seriously doubt it. The transition from most major Indian cities to the Netherlands consists of many different factors to adjust to. Some of these, one can fathom easily. The cold. Not being surrounded by idli-dosa and the like. Less obvious ones are: stepping out of the airport or a train station or a car and taking in a breath of air that doesn’t smell of diesel, petrol or chemicals; getting used to words that contain the same alphabet as English but look different and are sometimes rather long. Like the board in Schipol airport that reads: ‘babyverzorgingsruimte’. Familiar and yet not. And then, there are the less obvious factors like the silence. As the deep sleep of the jet lagged begins to wear off, and one thinks of rising and shining, the stillness is overwhelming. Where is that connection to the world through sound that never seems to cease in ‘Big India’? You rise finally, unable to listen to the only voice in your head, which is your own. You part the curtain gingerly and look out of the window. Where are the human beings? These empty streets, and the deafening stillness envelop you and you know you have arrived in the Netherlands. Just like ‘Big India’, there is in the heart of ‘Little India’ time and place for everyone and and everything and all of it all together. And one doesn’t have to feel homesick any more. ‘Little India’ by another name is called Amstelveen. From my vantage point, I can see through the windows on the first and second floors opposite me. Three screens. In each of them, women, single or in the company of other women. I am playing ‘bluff’ with my companions in an Indonesian restaurant on the first floor on the other side of the street. The apartments are well lit, the night clear, we are above street level, and I sit facing a window that looks into theirs. It’s an open invitation that I will not refuse. A choreography of simultaneous movements meets my eyes… she’s opening a packet of chips, settling on a sofa, collecting a handful, showing a companion something on a mobile phone and laughing, getting ice out of a refrigerator. Soundless visuals to which I add a voice over in my head ….. “she’s just returned form a hard day’s work, wonder how much it cost to buy that property in the centre of this city…where is the car park… a full length mirror in the living room hmmmm curious …. I hope she’s not lonely…wonder if anyone else lives with her.” My voice over makes them out to be women who are paid for their work and take decisions about how and where they want to live. Mistresses of their own fate. Earlier that day, I visited the ‘Open Air Museum’ in Arnhem. Whole neighbourhoods, houses and buildings have been dismantled from their previous locations and rebuilt here. In some of them, people in costume ‘dwell’ amongst the real objects and machines and communicate with visitors. This is how I could revise the workings of a steam engine and a windmill with some help. In other buildings, stories are told on televisions screens, like the one of Mr. Lau, immigrant from Hong Kong who started the first Chinese restaurant in Maastricht. The restaurant is there with its larder intact. With so much to see and experience, one might have missed Madam Ines completely amongst objects that fit in the world of men of those times. A huge warehouse – a reconstruction of ‘Van Gend en Loos’ showcases the firm in the business of the transportation of goods to and from railway stations. From the time of horse run carriages to vans and trucks. Underneath the wheels of a carriage is a declaration: beautiful horses and beautiful women cost money to maintain. It is in this warehouse that Madam Ines is to be found on a little screen beside a full-length display of a male uniform and boxes and crates. Madam Ines is in uniform too, and one has to strain a bit to hear her on the screen. The interviewer asks her why she decided to be a chauffer, the first in the Netherlands. There were personal reasons, she replies almost shyly. Yes, she had to follow a course, where she learned about loading and unloading cargo. Yes, she laughs, sometimes it is heavy work. We see her carrying a bunch of uniforms on a hanger, delivering them, getting a signature and driving her truck. A subsequent search on the internet reveals little about Madam Ines. Did I hear her name properly, I wonder. Does it matter? She’s another ancestor of mine, who for reasons she didn’t share, stepped from one role into another, woke up in the mornings put on her uniform, and left home to earn her bread. And now I see her through a glass, not in uniform, getting her dinner plate, and settling into a chair. Just another moment in the day’s routine. Only in another age. x : “ I’ll be in Amsterdam from 11th to the 17th” . Me: “You mean in Oegstgeest. I don’t live in Amsterdam”. X has been to visit me before and knows I don’t live in the capital city any more, but in a gezellig village in the south-westerly direction of Amsterdam. No matter how many times I try to change the equation, it always comes back to this: 4 x: Amsterdam = The Netherlands. And I’ve begun to wonder if the responsibility for the confusion lies with the slogan I amsterdam. I amsterdam conveys its meaning through English, not Dutch. It’s there for eyes beyond Dutch borders, and has become synonymous with tourism. A 6.5 feet high display at the back of the Rijksmuseum testifies to this. Although it’s forbidden to climb onto the letters, an average of 6000 people a day do so to make selfies. I amsterdam is the name of the travel card and of the official website for visitors. Ten years ago, as an Amsterdammer, I shared something of that of an I amsterdam’ feeling. I belonged to Amsterdam, and it belonged to me. Amsterdam was my village. I could get anywhere within the hour on my bicycle. It was my global village, accessible on two wheels. When I heard people complain of the ‘business’ in Amsterdam, I shook my head from side to side and smiled inwardly. They needed to visit Mumbai, my previous place of residence. By these standards, Amsterdam is far from busy even today, although the number of tourists swells by the minute, and the number of locals by the day. And I amsterdam welcomes everyone. The proposition to give up the marketing miracle I amsterdam has recently become a point of discussion in the municipality. At what point does the city where your home is, where you work, and where your children grow up begin to feel like it’s not there for you? Just a couple of weeks ago, a friend who lives there said he had no reason to go into the city centre. That was for tourists. As for his 17 year old son, just finishing high school, there was every reason for him to go into the city centre. Youngsters find jobs at the drop of a hat. Doing what? Serving tourists. The success of I amsterdam in drawing tourists by the millions has certainly spurred me to think about myself when I travel. 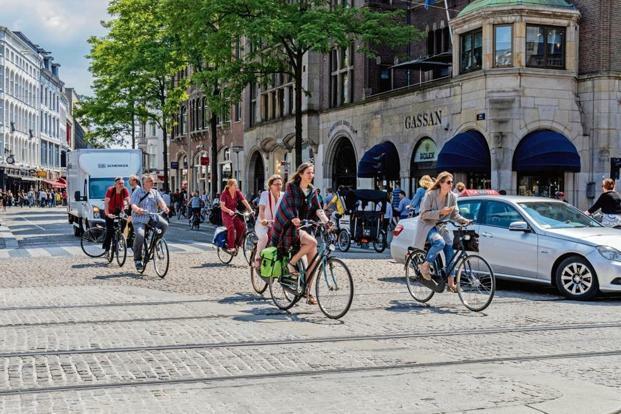 More often than not, on the streets and cafes of Venice, or in the city centre of Copenhagen, or gazing at the Berlin Wall, I am not any different from the uncertain figure on his or her rented bicycle, enjoying the ride on the Singel in Amsterdam, while I try to make my way to work. In those exotic European cities, I am the tourist. In Amsterdam I now occupy a space that isn’t covered by I amsterdam. I’m not a resident and I don’t visit it as a tourist. Both types of I amsterdammers can stress me out when I’m on a bicycle in Amsterdam these days: the one swerving left and right uncertainly on a rented bike, or full swing with a bunch of friends in party mood on the bicycle track and totally unaware of my looming arrival on my rented bike; the other cursing and swearing while he or she whizzes by at top speed, half crashing into me – late no doubt because of all these ‘others’ on the bicycle track. The way to do it, I’ve decided is to take the time, and cautiously make my way through this stunning city, which, I can honestly see exactly why millions would want to live in and other millions would want to visit. I’m not sure that the success of Amsterdam as a tourist paradise is to do with I amsterdam alone. That seems to be a simple way of putting the blame on two words with a strong message and incredible design.